Marsha Chandler is a professional artist who has won national and international recognition and awards for her exceptional watercolor paintings. A contemporary realist, she creates vibrant, intricate still lifes which express her love of the interplay of light as it reflects and refracts on everyday objects. Marsha states, “My medium is watercolor, which allows me to capture these distinctive qualities of light in a way no other medium can.” She paints with vibrant, saturated colors, layering to create depth, enhance shapes and add texture. Her creative compositions and innovative use of shape, contrasting values and color harmony turn those ordinary objects into extraordinary works of art. “I always look for a unique perspective and pairing of things, and when people look at my works, they are likely to find something surprising each time. I try to evoke a feeling of intimacy for the viewer and draw her or him into the detailed complexities of the painting to see and experience a new point of view or thought about that ordinary subject, whether it is fruit or vegetables, a shiny colander, the folds of cloth, a cut-glass bowl, Mason jars, or even tin foil and plastic bags” says Marsha. Marsha grew up on a farm in the Alabama foothills of the Appalachians, and the special awareness of light that she found in her everyday world as a child never left her. This inspired a passion for art that has been a vital part of her life as long as she can remember. When she first began painting, acrylic and oil were her mediums, but when she discovered watercolor, the love affair began. She painted for several years, honing her skills, and showed her work locally. After her children were born, she dedicated her time to them and then later to a real estate career. Even during that time, art remained a constant in her life. 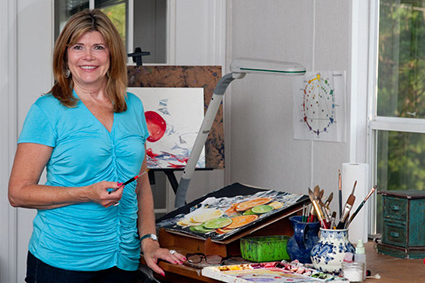 She reconnected with her love of painting in 2005 and made a commitment to grow and evolve as an artist to reach a professional level. Also she recognized that she had a passion for realistic still life painting and has followed that passion ever since. Today, Marsha is back on the farm--a gentle place in Douglasville, Georgia, where, as a successful artist, she has the best of both worlds with a pastoral studio not far from the cultural richness of metro Atlanta. Since becoming a full-time artist, Marsha has advanced her art largely through self-directed, independent study, and she has also taken workshops with nationally known artists. Her paintings have been accepted into numerous regional, national and international juried exhibits and have garnered a number of awards. In addition, she has had several solo shows in the Southeast. She has been featured in many national and international art publications as well as in local newspapers and magazines. Marsha is a Signature Member of the National Watercolor Society, American Women Artists, Southern Watercolor Society, Georgia Watercolor Society, Louisiana Watercolor Society and Watercolor Society of Alabama. She is a member of America Watercolor Society, Allied Artists of America and the International Guild of Realism. Her original works are in Xanadu Studios, Scottsdale, AZ; Dogwood Gallery, Tyrone, GA; and gallery43, Roswell, GA.